PhotographyREVIEW.com member and forum moderator, Jeff Impey, better known as Grandpaw, took it upon himself to create a Nikon D7000 Tips thread on the Nikon Forum. Since he began the thread in August of 2011, Grandpaw has added over 25 separate, numbered tips for Nikon D7000 camera owners and the thread has been viewed well over 5000 times. Some of the tips included are: how to access the virtual horizon; how to adjust the D7000’s built-in flash output; how to create your own personal shooting mode (user settings); how to add copyright information to your photos; and lots more! Even though the thread was created for Nikon D7000 users and some of the suggestions are specific to that camera, everyone should be able to pick up some new techniques by browsing Grandpaw’s D7000 tips. The Nikon D7000 has been one of the most popular cameras with the PhotographyREVIEW.com community, pretty from the moment it was announced. So Grandpaw’s D7000 Tips thread was really a great idea. It’s an excellent resource for new Nikon D7000 owners as well as experienced photographers. Grandpaw is constantly coming up with new tips and there’s no doubt everyone can learn something from that thread. If you’ve got your own Nikon D7000 tips that aren’t already included, please add them to the thread! 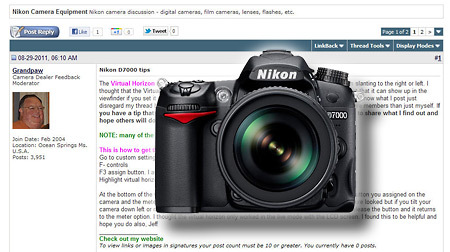 And if you own a Nikon D7000, please take a few minutes to write a review in our user reviews section. Besides the forums, the user reviews are a very important part of PhotographyREVIEW.com and a lot of people rely on them to decide on what cameras and other photo equipment to buy. 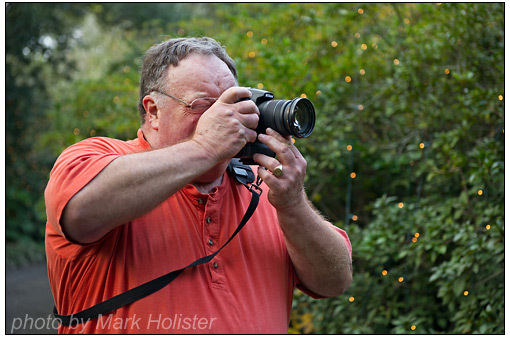 Grandpaw in action, testing out new tips with his Nikon D7000. Grandpaw has been a PhotographyREVIEW.com member since 2004 and he’s also the moderator for our Camera Dealer Feedback Forum. You can check out his photography on his Web site and his National Geographic Gallery, as well as his PhotographyREVIEW.com member gallery.